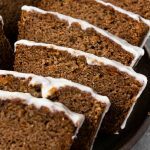 Paleo sweet potato spice bread is a delicious, easy, and freezer-friendly gluten free, dairy free, and paleo dessert or breakfast treat! Preheat the oven to 350°F. Lightly grease an 8.5" loaf pan and set aside. In a large mixing bowl, whisk together the almond flour, coconut flour, arrowroot flour, pumpkin spice, baking soda, and salt. Set aside. In a medium mixing bowl, whisk the eggs until beaten, then whisk in the oil, water, maple syrup, vanilla, and vinegar. Pour the wet (eggs, etc) mixture into the dry (flours) mixture and stir until combined. Use a spatula to scrape the sides and bottom of the batter, making sure that everything is well combined. Fold in the shredded sweet potato until well incorporated. Pour the batter into the prepared pan and use your spatula to level the top of the batter. Bake for 60-65 minutes, until the bread has risen and springs back slightly when lightly pressed. Remove bread from oven and cool 15-20 minutes in the pan before removing from the pan and transferring to a wire rack to cool completely. Once the bread has come to room temperature, prepare the glaze (if using) by whisking together the sugar and milk, then slowly pouring it over the top of the loaf. Use a spatula to spread it into an even layer, if necessary. Allow the glaze to set before slicing and serving. Optionally, you can fold in 3/4 cup of roughly chopped walnuts, pecans, or dark chocolate with the shredded sweet potato. Store leftover bread in an airtight container at room temperature for 2 days, in the fridge for up to 5 days, or tightly wrapped in the freezer for up to 3 months. The bread will keep best without the glaze.